My housekeeper, Azalea Berry, is one of those wonderful, old-fashioned Southern cooks who creates mouth-watering, waistline-increasing meals like you see on television cooking shows. My family, boarders, and I have never eaten so well. Azalea finally agreed to let me share one of her recipes for one of my favorite meals she makes. I hope you'll enjoy it too! Season meat, cut into serving size. Place a cup or so of flour into one shallow bowl and mix in salt, garlic and pepper to taste. (Note: for a spicier taste, use a touch of cayenne). In a second bowl beat the 2 eggs and add milk. Mix them together. Dip meat in flour, then in egg mixture, then in flour a second time. Shake off any excess flour. Fry in cast iron pan with about 1/4 to ½ inch of heated oil. (Note: make sure the pan is hot enough to fry but not too hot to burn the oil.) Cook until meat is done and coating is a deep golden brown. Next you make the milk gravy by using 3 tablespoons of the grease used to fry the steak and add 3 tablespoons of flour, mix well and add milk to the consistency of gravy you like. Add some homemade biscuits, green beans and iced tea, and you have a great Southern meal. Looks delectable. I believe all foods could be improved if they are "country fried." As a native Texan, I can vouch for the authenticity of Azalea's recipe. And boy is it good. I also use a bit of cayenne to spice up my dredging flour. There is not much better on this earth than this meal. 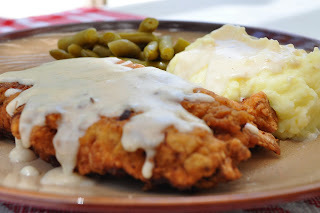 (Although most Texans call it "Chicken Fried" steak instead of "Country Fried".